In a darkened room of Chelsea’s Jack Shainman gallery last month, I watched Richard Mosse’s new short film “The Enclave,” as the disembodied eye of a Steadicam roved a mountain landscape—pink, impossibly pink—with inhuman sweeps. On a mountain slope the color of cotton candy, the camera edged down a gravel road and approached a strange black form in the distance. A truck came hurtling around the corner, close to the mass, and continued out of frame. Slowly, I could see that the form was a corpse splayed in the middle of the road, and the camera swung coldly around it in a circle like a vulture before cutting out. Before this, I’d seen only a number of large landscape photographs by Mosse. 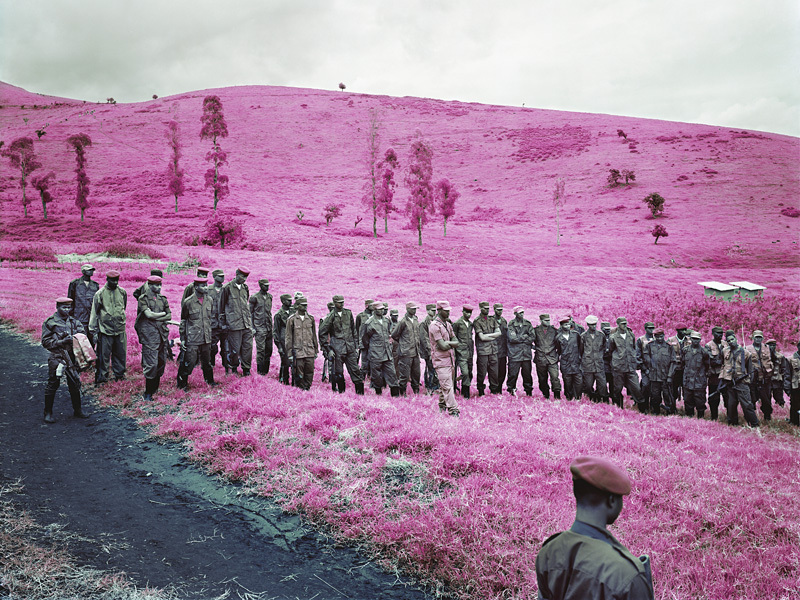 In each, the lush grass and rolling mountains of the Democratic Republic of Congo appear, as the artist describes them, “bubblegum pink,” shifting an otherwise straightforward terrain into something Seussically psychedelic. I was surprised to learn these images aren’t Photoshopped. They’re taken with an infrared Kodak film originally developed in conjunction with the U.S. military for government surveillance in World War II. The green chlorophyll from healthy plants reflects the infrared and appears hot pink; man-made camouflage absorbs the color and appears black. Thus, the camera ferrets the enemy in hiding. In photography, documentation has been on trial since the birth of the medium. It rattled around the conscience of war photographers in the U.S. Civil War, when the corpses of dead soldiers were rearranged to appear more emotionally engaging. It consumes the conversation around the depiction of conflict in contemporary journalism. 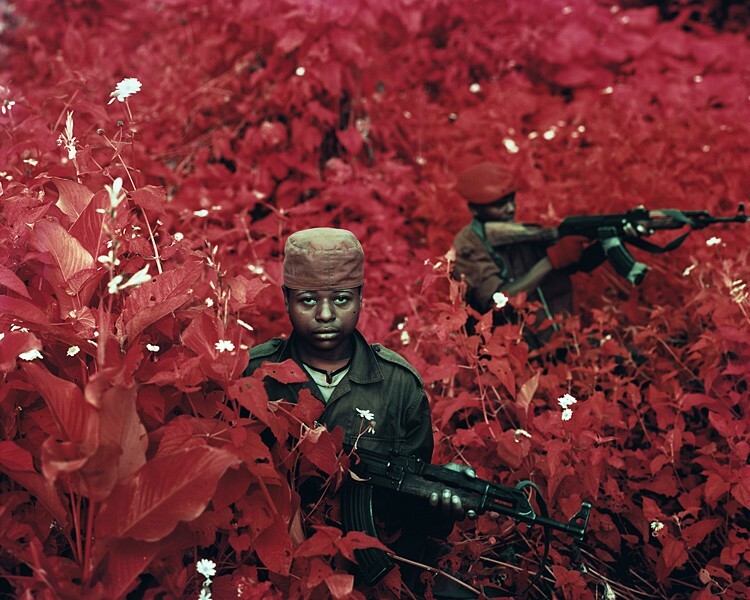 Even outside the context of war, documentary photography is often mistaken for naturalism. To cite a more literary example, the U.S. government hired photographer Walker Evans and writer James Agee to document the dustbowl farmers of the American West. Evans’ photographs of the living rooms of the poor raised eyebrows when they contrasted with written accounts of the exact same living rooms by James Agee, who meticulously catalogued and detailed the dimensions of every object. One of them was lying—rearranging the furniture—and it was probably Evans. In contrast, Mosse rearranges the furniture in color only. The sky appears blue, the clouds white. The natural green alone has been turned comically pink. Mosse’s photographs, however, transcend the simplicity of a middle finger to Truth. (I’m thinking, specifically, of Ai Weiwei’s literal flipping off of historical buildings—fantastic, but another animal still.) The photographs and, now, his new film pursue something greater to me, something more than this fine—but rather flat—thought experiment about Truth. “The Enclave” is split between six projection screens—four arranged in a central square and two on the outskirts—accompanied by Ben Frost’s unsettling score of radio signals, Congolese field recordings, and electronica. Shot between 2012 and 2013 around Lake Kivu in east Congo, Mosse explores the same territory as his photographs with sound, movement, and—most interesting for me—far more people. We follow the slow, ghostly perspective through displaced person camps, jungles, and town halls, receiving what little narrative Mosse provides in brief vignettes. The camera wafts through a village where men and women are milling about casually. One man stops and turns to something on the ground—again, it’s a corpse lying in the middle of the plaza. No one appears upset, only puzzled by who or how. This is not an uncommon sight for these men. The camera cuts to a tense march behind an armed fighter walking down an empty road, either side flanked by tall, pink grass. An elephant emerges from the pink and crosses the road in two steps, then vanishes into the pink, a two-second reminder that this is the Congo. In another scene, the camera floats into a church packed with people for a talent show. Two men breakdance. The audience claps along. One man ignites a hoop with kerosene as his friend jumps through it, throwing himself again and again through a ring of fire. Mostly, the audience smiles, unless they look directly at the camera. Then, the look becomes more complex. What could easily overflow with exoticism and exploitation is soon stoppered: the living stare at the lens of the camera or at the cinematographer behind. They grimace, they accuse, they defy. I’m unclear how the clearly Irish Mosse was allowed to accompany armed rebels, but it’s clear from their expression that the relationship is fraught. 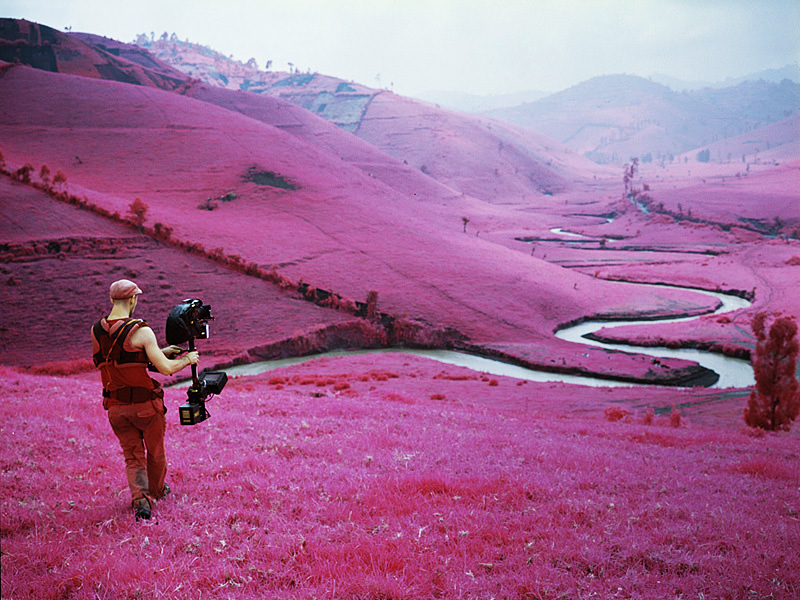 With its screaming pink hills in the background, Mosse’s rose-colored footage points to a screaming awareness of Joseph Conrad’s Heart of Darkness, the winded history of white men portraying the Congo. A camouflaged fighter glares at the lens, as if facing off. The breeze blows his cap and he blinks fast in the sun. In a way, his subjects’ fixed stare highlights Mosse as much as it does the landscape, a crucial aspect of “The Enclave,” reminding the viewer that yes, this is not the true Congo—and what is?—but the Congo through a white man’s eyes. Still, isn’t a knowingly troubled eye better than ignorance? At times, the screens play the same footage simultaneously. Othertimes, only one screen lights, or all run a different scene. Standing in the center of the four-screen square, I had the unnerving feeling of being watched myself. On a riverbank, three men aim their rifles at the far shore. An armed rebel appears behind me, staring directly at me, then vanishes, only to reappear behind. I would turn around to catch him just as he left the screen and appeared next to me. It’s not clear if they’re waiting for the enemy—or if the enemy is me. In another scene, the residents of a village lift an entire wooden house from the foundation. With about fifty men on all four sides, they lift the house and float it several feet down the road. On two separate screens on the periphery, several men prepare a child-sized coffin for burial. Some people are weeping, others are fixed on the burial rights. With all screens playing, I found myself blocking the projector and casting a shadow over the film. The other viewers in the room would glare at me. This happened to nearly everyone—it seemed there was no good place to stand without screwing everything up. In this subtle way, Mosse implicates the viewer as much as his subjects or himself. We see several corpses, but never any direct violence, exactly. The transformation from human to corpse happens offscreen. The violent images we do see are highly abstracted through color or metaphor—the young man jumping repeatedly through a flaming hoop, for instance. To some, the effect might feel passive, that it ignores the violence or merely observes rather than participates in the conversation, but I think this is a crucial aspect of its significance—and the difference between what approaches work in portraying political conflict and which don’t. If Mosse had shown us unbearable gore, we might easily become as immune to these images as we have to the news. It would create nothing beyond a sense of exploitation soon forgotten. The artist, it would seem, has already decided what to think for us, and is now demanding we agree. What kind of conversation is that? Instead, Mosse sets the scenes at a remove. By pointing to the violence just offscreen, the mind is forced to approach it on its own terms. What we imagine can disturb us profoundly. I’m reminded of Maggie Nelson’s recent The Art of Cruelty, in which she offers her own ideas on the depiction of violent images in art. An installation from Chilean artist Alfredo Jaar, Untitled (Newsweek), depicts the covers of Newsweek during the Rwandan genocide. Of course, none of the covers mention it, and Jaar includes a card under each cover detailing the concurrent events in Rwanda. The installation left her cold and feeling like Jaar was making an obvious point, that the U.S. had ignored the conflict for months. For Nelson, “space is distinct from alienation. It is fundamentally about volume rather than about distance.” The Jaar installation offered no space for Nelson to think and left her distanced from the material. Nelson points out that Jarr “has simply replaced the hierarchy of Newsweek’s attention with his own.” Art should expand the thinking space, not narrow it. The result will draw the viewer closer. In a similar way, Mosse gives his viewers enough space to meditate on the conflict without blinding them to massacre or numbing them with bloodshed. For example, a group of fighters-in-training lounge around outside, making each other laugh, running around—generally having a good time. They split into two teams and run through a mock battle, racing among each other and miming a rifle blast that sends the opponent tumbling to the floor with a slight smile on his face. If you didn’t know better, you’d think it was a game of capture the flag. The scene ends with a small child to the side, watching. He waddles over to one of the “dead” and shakes his body. As we try to understand the conditions that could press humanity toward this cruelty, we watch the child trying to understand. Another scene, again, follows directly behind a rebel leader through thick jungle—the result is an explosion of fully saturated pink, darker this time, closer to the color of blood. The tone suggests that this is not a drill. The camouflaged man in front creeps slowly and quietly through the jungle path for minutes. The camera obediently follows behind. Suddenly, he shouts, glances quickly back at the camera, and breaks into a sprint—the camera cuts off and we’re left to imagine what came after. In these broken scenes, “The Enclave” says as much about humanity as it does about conflict in east Congo specifically. Certainly, the time and place are crucial, but Mosse resists striking the audience with any clear political or emotional blows. The viewer is given space, space to meditate on his knowledge or—in my case—lack of knowledge on the conflict in east Congo and Rwanda, and space to meditate on the impact of violent human conflict in general. After forty minutes, the film had restarted, and I started to walk out. On two screens behind me, a man with an assault rifle strapped to his back walked calmly into the waters of a lake, presumably Lake Kivu, until he was completely submerged in water. The camera stays on the lapping surface of the lake. Pink hardly appears here. There are no bubbles. The man never resurfaces.